Giant Eagles may move 4 hexes. They are flyers (check out our special rules section for rules on flyers). Points value: 40 (when using our Army building system) and counts as 1 level of War Council. 1) Spend 1 lore to make a 'swoop attack'. Spend this lore BEFORE moving. The creature may now attack 1 unit it flies over this turn with 2D. The attacked unit counts as unsupported for this attack and may not fight back. This counts as the creature's battleaction for this turn. 2) Spend 2 lore to make a move as normal, battle as normal but then make another move of UP TO 4 hexes towrds the creature's own battle edge. 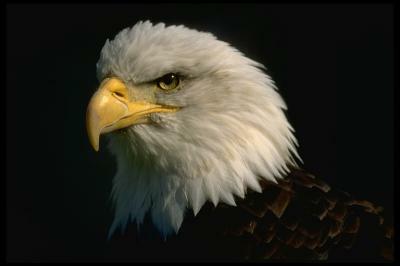 Giant eagles are very dificult to kill, being fast and flying of as soon as they are in danger. They can be used to finish off damaged units or to try and split up supported enemy lines by making their 'swoop attack'. Use any available figures of War Eagles. Us as many figures as you want, but remember that they are considered 1 creature!